The pavilion of the Suryakund was the elegant setting for the arangetram of Vaishnavi Viswanath, whose performance was the personification of grace and elegance. The pavilion of the newly consecrated Suryakund was resplendent with lamps and flowers. Lights rippled on its huge stone walls creating an effect that was magical and ethereal. The dais was decorated simply, and elegantly invited the dancer to ascend its space. And she did. Vaishnavi Viswanath, personifying grace and elegance climbed on to the stage with the confidence of a professional dancer. 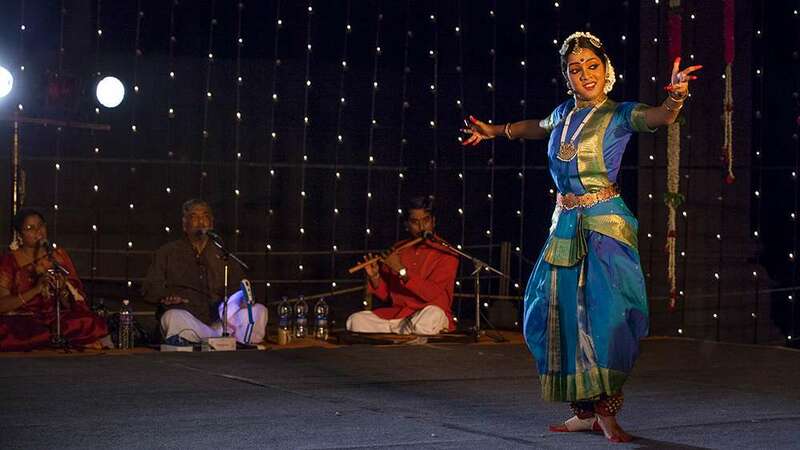 Yet, this was her arangetram – her debut performance, but few would have thought so from the ease and confidence with which she presented herself. “Arangetram” is a word in the Tamil language which means the etram or ascending of the arangu or performance stage by a dancer, on the completion of her training. It takes place only after the student has acquired a substantial and qualitative, high-standard repertoire. An arangetram is the first public performance, the debut which takes place in the presence of one’s guru, fellow artists, family and friends. This event on March 16th saw the debut of many things at the Suryakund pavilion. The Bharatanatyam arangetram of former Isha Home School student Vaishnavi Viswanath also marked the inauguration of the Suryakund pavilion as a venue for all future debutant performing artists. It also marked the debut of her teacher Anitha Suren, disciple of Kalaimamani Indira Rajan, on the nattuvangam. The accompanying musicians were Anil Kumar on the mridangam, a disciple of Karaikudi Mani Iyer. 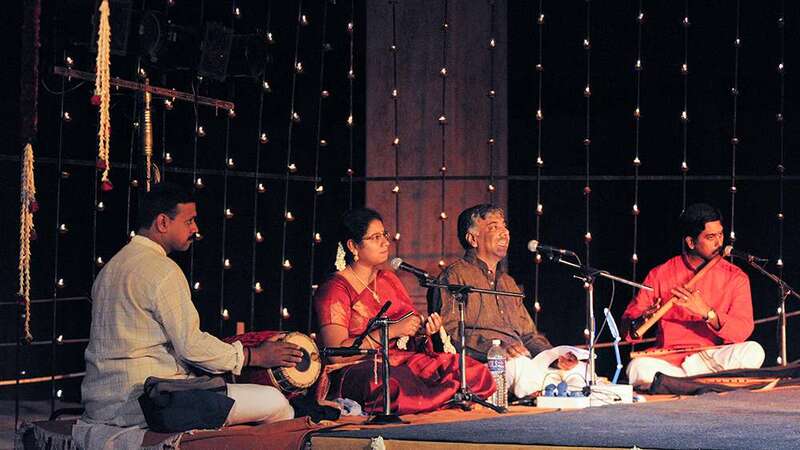 On the vocal was Viswanath Parasuram, Vaishnavi’s father, and on the flute was Muthukumar, a disciple of N.Ramani. Kalaimamani Indra Rajan inaugurated the evening’s performance by lighting the lamp. The arangetram started with Vaishnavi rendering an invocation song to Goddess Saraswathi beautifully. The repertoire of the program for the evening included Pushpanjali, Alaripu, Jathiswaram, Shabdham, Varnam, Padam and Thillana. Vaishnavi’s performance was graceful and rhythmic. 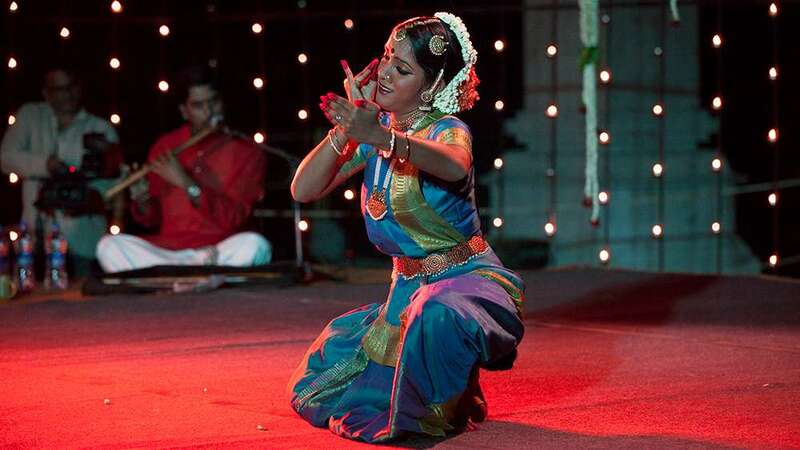 The intricate rhythms of the jathis were intensely performed, capturing the audience’s attention, and fetched her a round of applause after each jathi. The abhinaya was apt and so communicative that the audience was able to relate the songs with her expressions. Beautifully written! Takes us there. Lovely photographs and description. God bless Vaishnavi! Hope you continue to enjoy dance for a long time to come. the pictures are wonderful and she looks like she really is very talented. Thank you for sharing!